General Thermodynamics (continued from page 22) model 300-A BMEP balancer that is used to equalize the cylinder load of any multi-cylinder internal combus- tion engine equipped with individu- al fuel adjustments. The balancer is described as being designed to fit the standard indica- tor valve. It is quickly connected and sealed with slightly more than hand-tight torque. When the indica- tor valve is opened, the pressure guage will come to a reading. The pointer is steady and will stay fixed as long as the cylinder load is not changed. Keeping the engine load constant, readings are taken for each cylinder, then fuel adjustments are made either up or down until all cylinders yield the same pressure reading. Each cylinder is then deliv- ering equal power. Along with the application, the construction and operation of the balancer are described, and some of its characteristics are listed, such as steady, accurate, repeatable, reli- able, requires no maintenance, fits standard indicator valve, and easy to use. Wash., has developed a complete system for administering catalyst into the fuel oil of a diesel engine. The Ferrous Marine System (FMS) consists of a proportioning pump, depulsing unit, and 24-gallon day tank for injecting Ferrous FE-4 cat- alyst into the fuel oil at a ratio of one gallon per 3,000 gallons of fuel. The proportioning pump allows accurate injection of the FE-4 cata- lyst from the day tank into the fuel line. It is powered by a variable- stroke, oil-driven diaphragm pump that operates on 115-volt ac. On special order it is available with dc and multiphase pump motors. The pump comes in various output ca- pacities, measured in gallons per minute or hour, to meet virtually any fuel flow requirement. Gems Sensors Division of Plain- ville, Conn., has introduced a com- panion digital indicator for use with its Flow Ranger flowmeter. The in- dicator provides a readout of flow rates of 0-36 gallons per hour and 0-360 gph, as well as cumulative consumption rates. The positive-displacement Gems flowmeter measures these flow rates, and the indicators provide an accuracy within two percent of ac- tual flow rate. The indicator case is made of durable steel, and measures 3% by 6'/s inches. Used with Gems flowmeters they provide total sys- tem control and insure uninter- rupted flow of liquid to its point of use. Diesel. Fuel savings provide a rapid payback of the cost of the conver- sion. TIB configuration produces the same horsepower at the same rpm as the NA arrangement, but does it with significantly less fuel. Alterna- tively, the owner may elect to use larger injectors to achieve greater horsepower output, but still at a competitively low specific fuel con- sumption figure. Golten's specially trained techni- cians will be on call, on short notice, to service these engines and turbo- chargers at any U.S. port. Under this agreement, Golten is also au- thorized to sell original MHI spare parts and perform "warranty" re- pairs and normal maintenance. Inc. of Souderton, Pa., produces a full range of babbitt alloys for ma- rine applications. All material is re- fined in accordance with specifica- tions QQT390A and ASTM B-23. Grant's babbitt is currently used in marine bearing facilities through- out North America. San Francisco, Houston, and Chica- go. Selection of appropriate lubri- cants for marine equipment is one of the most important steps toward insuring maximum protection of marine engines and efficient opera- tion of vessels. To aid in the selec- tion process, Gulf Oil Corporation has published a guide to its com- plete line of marine products. Gulfs marine lubricants as well as detailed data sheets on the proper- ties of individual grades of lubri- cants. Gulf marine products are avail- able from many midstreamers and commercial marine outlets. A con- venient pull-out folder included in the brochure identifies the ports where Gulf marine service and prod- ucts are available. Ltd. of Poole, Dorset, England, is well known in both the U.K. and overseas. The company manufac- tures and supplies a comprehensive range of equipment allied to marine diesel engines. Each product is backed by an international spares and service network with a 24-hour turnaround. Distair, the unit is a two-stage ma- chine having a capacity of 15 cubic meters per hour and a maximum discharge pressure of 30 bar. It has a horizontal configuration, with the single-cylinder diesel engine mounted above the compressor crankcase. The combined compact unit has a simple three-point mounting, and requires no external services apart from sufficient ventilation. The set meets the requirements of the major classification societies, as do the re- mainder of the Hamworthy range of compressors. With complete acces- sibility for servicing, these compres- sors are designed for all marine duties including starting air, and have capacities ranging from 83 to 735 cubic meters per hour with pres- sures up to 40 bar. The company's Sea Star diesel fuel blender has been in service for some time, with many well-known vessels showing substantial reduc- tions in fuel costs. The compact unit blends relatively cheap oil used in the main engines with the more expensive generator diesel oil. The blended oil is then supplied to the generator without using additional pumps, heaters, or filters. With con- ventional blenders, there is a danger that the two fuels could stratify in the blended fuel service tank. A range of horizontal triple-screw pumps also manufactured by Ham- worthy are designed to handle light- viscosity oils, heavy fuel oils, and lubricating oils. 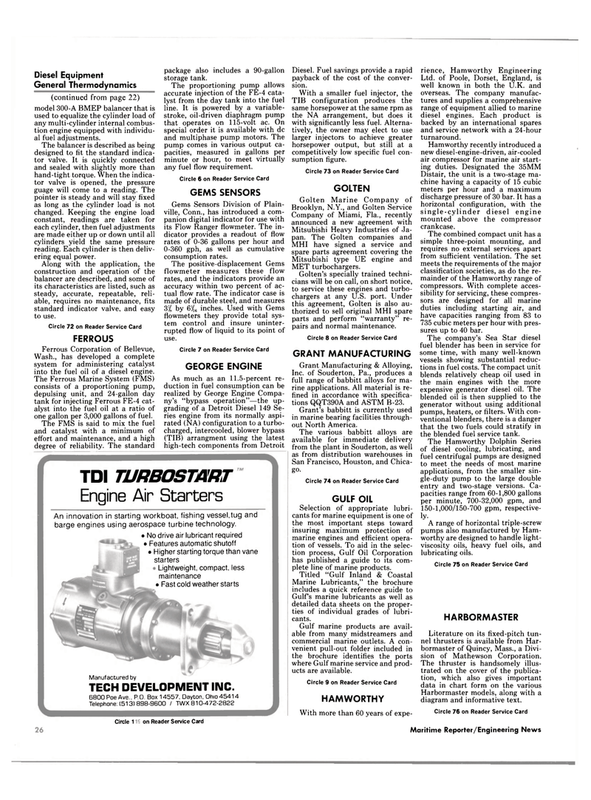 Literature on its fixed-pitch tun- nel thrusters is available from Har- bormaster of Quincy, Mass., a Divi- sion of Mathewson Corporation. Harbormaster models, along with a diagram and informative text.